Charming holidays: The unspoilt tranquil beauty of Alvor holidays is what attracts holidaymakers here in their droves. This pretty whitewashed village has retained its roots – it’s still used as harbouring point for fishermen today. And the surrounding orchards, fruit groves and sweet smelling pines only serve to enhance the attractiveness of Alvor holidays. Peaceful holidays: There’s an unrivalled opportunity for relaxation at Alvor, especially if you choose to have all inclusive holidays here. It’s a real option if you’re searching for peaceful Mediterranean holidays. That’s not to say there’s nothing to do here though, as there’s a golf course, aqua park and beach all within easy reach from Alvor holidays. Megalithic Monuments of Alacar: A fascinating site, primarily for the fact of how old it is! The burial chambers and tombs found here are incredibly over 4,000 years old. The Megalithic Monuments are an amazing, world-famous attraction available for you to see on your Alvor holidays. Abicada Roman Ruins: It’s still possible to see the structural foundations of this Roman site, which dates back to the 1st century AD. And whilst the walls sadly no longer remain, it’s also possible to see elaborate, colourfully decorated mosaics. Alvor Castle: Back during the Moorish occupation of Portugal, Alvor was a thriving port town. As such a spectacularly grand castle was built here, which unfortunately perished in the two earthquakes the area suffered in 1532 and 1755. Today, only 2 walls and a turret remain, but it’s still interesting to see the structural style of the castle nonetheless. Ethnographic Museum: This charming little museum is certainly of interest to visitors to these beautiful shores. It primarily focuses on the everyday lives of the people of Alvor, demonstrating the agricultural means on which the residents in the past depended. Alto Golf Country Club: At less than 1km away from the centre of Alvor holidays, this golf course is perfectly placed if you fancy a quick 18-hole round on your all inclusive holidays to Alvor. The last course to be designed by the famed Sir Henry Cotton, the Alto boasts lush greens and winding fairways as well as the longest par 5 hole in Europe. Alvor Church: This small whitewashed church has an incredibly ornate entrance and bell tower. The interior is just as beautiful with colourful tile panels and decorative carvings at the altar. Torralta Beach: This meltingly beautiful beach has a seemingly endless stretch of fine golden sand. The whole coastline of Algarve holidays is made ever more attractive by the burnt amber coloured cliff faces which follow each beach in the area. That’s also the case here, with several tiered rocks overlooking the edge of the sea. Prainha Beach: Prainha is actually made up of a series of small, secluded coves that make the perfect places for a quiet day’s sunbathing on your holidays in Alvor. Children on their holidays will be full of wonder on visits here, as there are all sorts of rock pools, caverns and overhangs to explore. Praia do Alvor: The resort’s main beach, this 2km stretch leads you all the way to the town of Lagos. Alongside the golden sand and inviting crystalline waters, the area is also of interest to nature lovers as there are shallow lagoons and an estuary that all attract a wide variety of birds. Ruccula: This famed restaurant has a sunny colourful interior awash with bright yellows which seem to match the golden colour of the sky around the shores you’ll see on your holidays here. The view from wherever you’re eating is just as beautiful too. The food is an excellent combination of local favourites and international classics, all created with fresh Portuguese ingredients. O Luis Restaurante: Based right by the beach, this restaurant couldn’t be in a better location. The menu is an eclectic affair whilst making the most of the fact the restaurant can source its fresh fish directly from the coast. Georgets: For classic Portuguese fare, look no further than this utterly authentic restaurant. 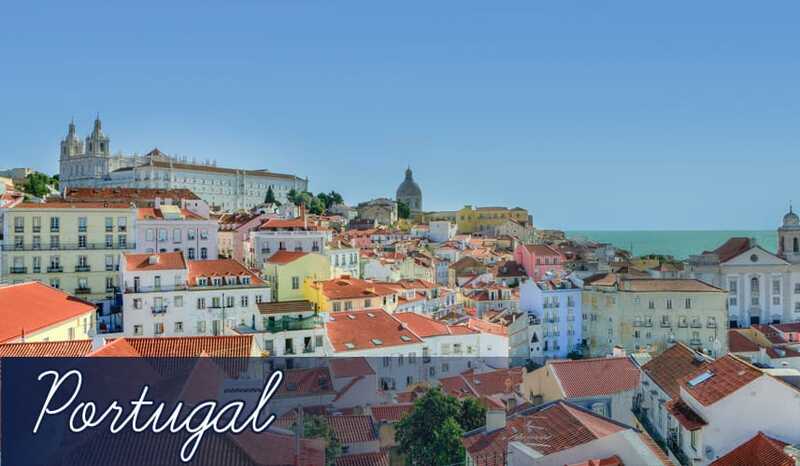 It serves the very best dishes to have emerged from Portuguese cuisine, including Piri Piri chicken (a zingy dish made with chilli and lime) and freshly grilled swordfish. Various bars: Alvor holidays have a variety of karaokes, cabarets and family-focused bars all grouped together in the central streets and squares of the resort. The Venue, Tucano and Delfim all specialise in live entertainment with singing, dancing and even fun comedy acts. If you just fancy concentrating on drinking (with maybe a little singing of your own by the end of the night! ), head to bars such as Mourisco, Boralo Bar, The Irish Inn and Paddy’s Bar. All are great if you’re looking for a friendly welcome and a warm atmosphere during cheap holidays in Alvor. Cheap supermarkets: Despite being a fairly small fishing village, Alvor holidays are well supported with two supermarkets, Continente and Torralto, which offer a wide range of food at very cheap prices. They’re a great choice even if you’re on all inclusive holidays and just fancy picking up a cheap lunch for the beach. Markets: There are several markets held at different times in Alvor. There’s a general market available daily which is eye-opening for its extensive range of vibrant fruit and vegetables, as well as handicrafts and antiques. But if you’re after an even larger range of souvenirs and original crafts, you’ll prefer the gypsy market held on Tuesdays once a month.